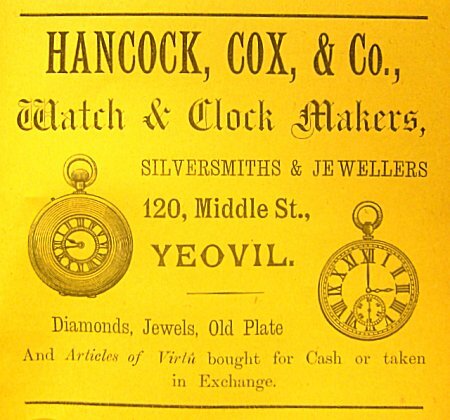 James Hancock was born in Yeovil in 1791, the son of John White Hancock, a Yeovil clockmaker, silversmith and jeweller. An example of his clock-making skills is shown at left and below. 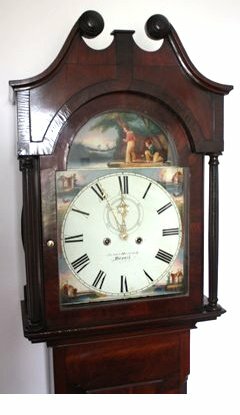 This particular clock is an 8-day long-case clock crafted in a flame mahogany case and featuring a nostalgic fishing scene and country cottages. The Accounts of St John's Churchwardens record payments to him almost annually from 1837 until 1853 for the clock and chimes maintenance at St John's church. In the Somerset Gazette Directory of 1840 there is a listing for his father 'John Hancock, Watchmaker & Silversmith of the Borough' while the same directory lists his brother 'John William Hancock, Silversmith & Jeweller of Hendford' (John Jnr's only trade directory entry) and 'James Hancock, Watchmaker & Silversmith of Middle Street'. James was also listed as a 'Silversmith & Jeweller of Middle Street' in the same Directory. 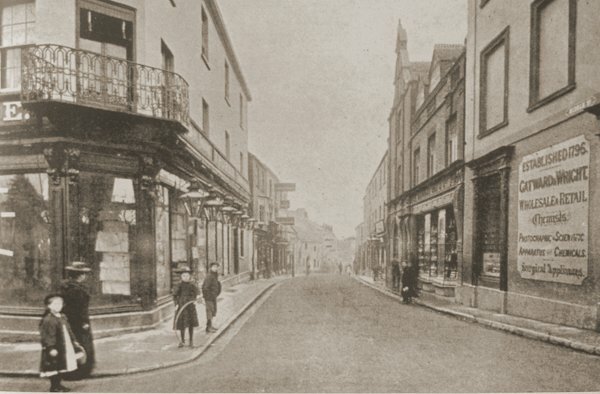 By the 1841 Census James was living over the premises in Middle Street (see photograph below) immediately next door to the Medical Hall on the corner of Middle Street and the Borough.. with his father and sister Sarah. Also living above the shop was 20-year old William Cox and a domestic servant. John, James and William Cox all gave their occupations as silversmith. John White Hancock died in Yeovil in 1843 and his son James, who remained a bachelor, took over the business. In the 1851 census James and his sister Sarah were listed at the Middle Street premises with their other sister Mary Cox, her son William Cox and a domestic servant. 60-year old James listed his occupation as 'Watchmaker & Jeweller, employing 2 men', Sarah was listed as his housekeeper, Mary was a 'Carpenter's Wife' and William Cox was described as a 'Watchmaker's Assistant' - clearly one of the two men employed by James. 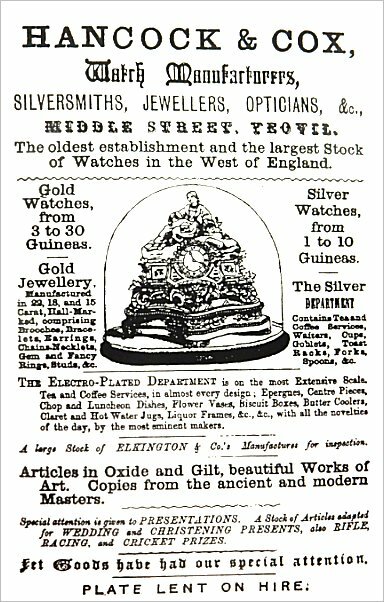 In 1850 and 1852 James Hancock & Co of Middle Street were listed in several trade directories as, variously, Watchmakers, Clockmakers, Silversmiths and Jewellers. In 1854 the company was listed as Hancock & Co in the Churchwardens' Accounts. By 1855 James had clearly gone into partnership with his sister's son and long-time assistant, William Cox. The new company of Hancock & Cox, were listed in several trade directories from 1855 until the spring of 1862 when James Hancock died at the age of 71. William Cox continued to run the company as Hancock & Cox until 1872, after which the company was listed as Hancock, Cox & Co, of Middle Street, until 1894. A report from the 21 December 1839 edition of the Somerset County Gazette praising the work of James Hancock. 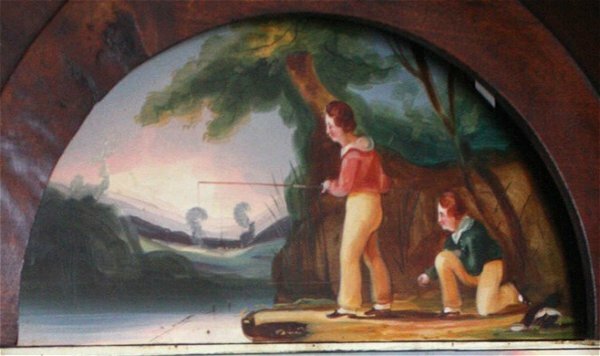 The decorative enamel panel showing a fishing scene from the long-case click above. 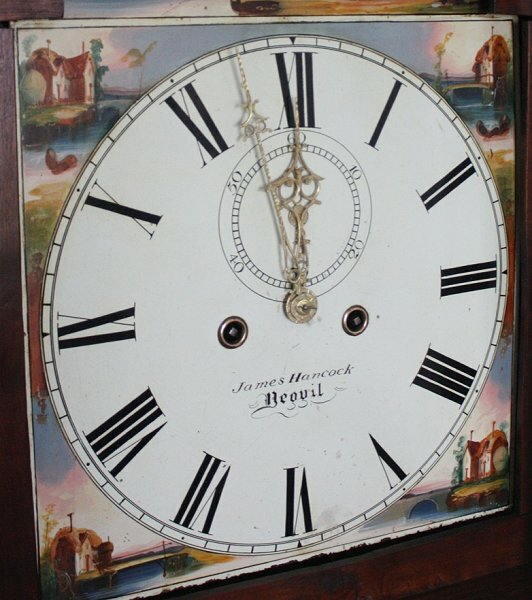 The enamelled face of the above long-case clock with cottages in each corner. 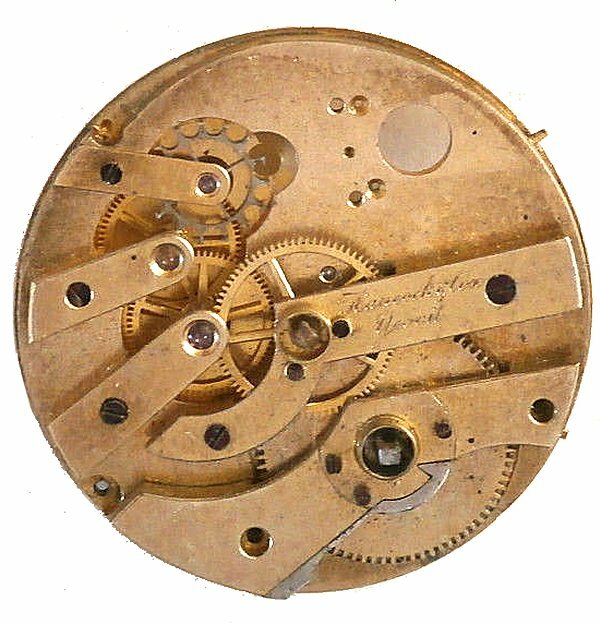 A pocket watch movement by James Hancock (and yes, of course it's magnified). 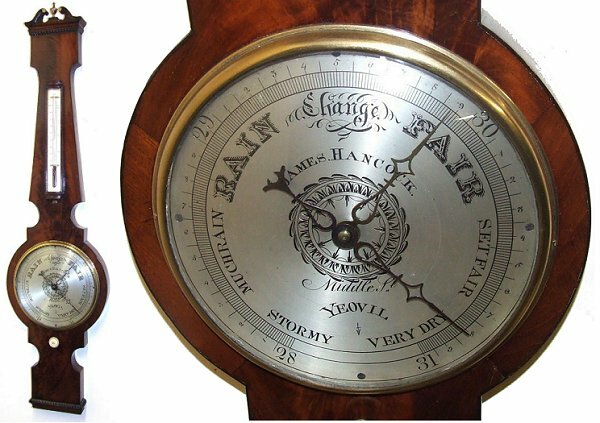 A fine barometer dating to about 1840, shown with a detail of the dial face, made by "James Hancock, Middle Street, Yeovil". The case is mahogany inlaid with ebony and has a thermometer with a silvered back marked in Fahrenheit. The engraved and silvered dial has a blued steel finger and a brass finger. The barometer stands 39" (99cm) high and is 10" (25.5cm) wide. The dial diameter is 8" (20cm). An advertisement for Hancock & Cox from the 1875 Somerset Directory. 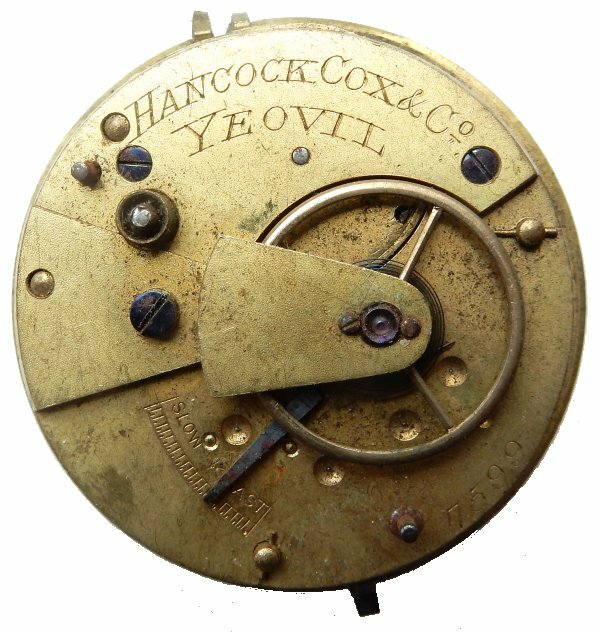 A pocket watch movement by Hancock Cox & Co (and yes, this one is magnified as well) dating to between 1872 and 1894. It measures 1¾" (44mm) in diameter. .... and an advertisement from the 1882 edition of Whitby's Yeovil Almanack Advertiser.